Wick 'N' Vape has been a staple in sub ohm coil wicking for years. Their U.S. grown cotton is one of the leaders in dual fiber cotton used for wicking e-liquid. Specifically created for the sub ohm vape experience this cotton features a tasteless base to work with meaning its ready to vape in no time. 4 inches in length with the right amount of thickness and fluffiness to efficiently soak up your favorite ejuice. 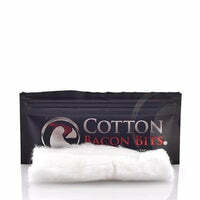 Cotton Bacon is a must have for any vaper who enjoys pure taste and hassle free wicking. Cotton Bacon Bits V2 - Wick 'N' Vape has a rating of 4.8 stars based on 15 reviews.